Yes we (all) have DOS installed on our retro x86 machines, but there are many Oses out there worth trying, if only for a couple of minutes. I propose to share some of them here, from one-floppy OS to installers to live CDs, all while staying in compliance with the forum's rules and legality, so only demos, trial versions, free for non commercial use releases and free software. There'll be stuff for platforms ranging from the 8086 upto the Pentium and beyond, and other platforms perhaps. Some will be very basic, usability-wise, some will be more complete, I hope everyone will find someting to his/her liking, and maybe some of you will discover new old things to enjoy between two sessions of Doom on your 486! Feel free to comment, post your new or past experiences with them, share links to other Oses that deserve getting into the light once in a while. 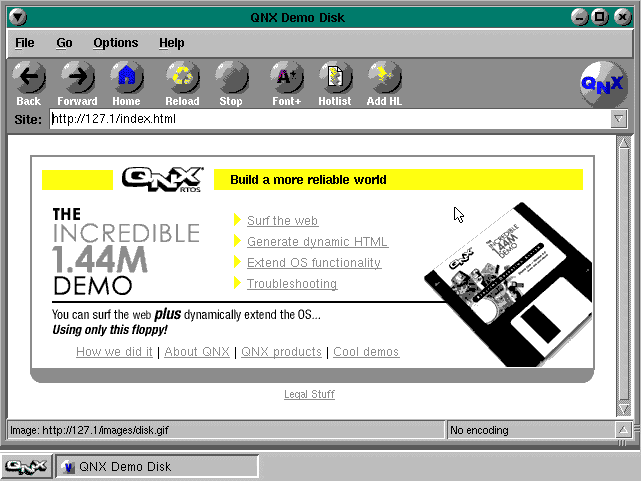 So to start things, I'm sure many of you know the famous 1.44MB QNX Demo Disk, but which version exactly? Sounds like a good idea, but not confident on the legality bit. I'd love to share OS/2 (I have Warp 3 and 4) and BeOS (x86 r5) for example, but have no idea which versions would be OK and which not. And there are OSs which were free to download, but came with specific restrictions on redistribution (Sparc Solaris 9 springs to mind). Stuff that were free for non commercial use should be fine, like the BeOS Personal Edition installer for example. It worked with the full editor, the "Quick Reply" function gave 5 JS errors and did nothing. I'll come back to QNX another time as there are more free for a personal use and demo versions around, both for PX/XT and Pentium and upwards systems. dionb wrote: Sounds like a good idea, but not confident on the legality bit. But for now, let's dive into the OS/2 world, with the follow up to OS/2 Warp 4 called eComStation, developed and maintained by Serenity Systems, which added many features not present in Warp 4. Serenity Systems released a couple of versions of an EcomStation LiveCD downloadable from their website over the years. You'll need atleast a Pentium 133MHz and 160MB RAM to run the LiveCD version. Among the many on 1-floppy OSes, most of them being based on Linux, and a few on BSD, there are completely different systems out there, such as MenuetOS and a fork of it called KolibriOS. MenuetOS is being written entirely in assembly language, is not based on any other systems or following UNIX/POSIX standards, it exists in both 32 and 64 bit flavours. The 64bit version is released under a Free for personal and educational use license, the 32bit one is under GPL, the latter hasn't been updated in a few years though. Another system entirely written in x86 assembly, V2_OS, created in 1999 in the Netherlands, claims to be "the fastest operating system available for the 386+ PC." It needs only a 386DX and 2MB of RAM to run correctly, though it will be a lot faster with a better CPU and more memory. The bootdiskV2_064.img won't boot on machines without an IDE hdd present, however the bootdiskV2_064-nohd.img will work without issues. Last edited by lolo799 on 2018-7-29 @ 17:59, edited 1 time in total. I have Slackware 3.0 on my 486, but not sure how many unix/linux types we have around this forum? I'm not really into OS/2. Heyy @lolo799 that Menuet looks awesome. I'm gonna go check that out. I'm guessing they both rely on pentium instructions? I only have the 486 up and running to toy with now. Kolibrios says i586, menuet doesn't have any requirements listed. BeginnerGuy wrote: I have Slackware 3.0 on my 486, but not sure how many unix/linux types we have around this forum? I'm not really into OS/2. There are some alternatives OS people around, just not many in my thread! Yes, 32bit Menuet needs atleast a first gen Pentium, and plenty of memory. Scratch that, old versions of Menuet can run on 386 cpu, if you check the old website, though you'll need a VESA 2.0+ compliant graphic card. Try Kolibri too, it's still updated for x86 and comes with more applications. I like the look of the DE on KolibriOS. That would be a fun upgrade for the retro machine. It does say in the wiki that it requires i586 (pentium) or higher as well. I have a S7 board with a MMX233 tucked away somewhere in the closet I could pull out to try, but it would be really cool to top off my 486 with 64MB and be able to run a nix OS with a desktop interface. I took the screenshots on 86box and/or qemu, when the former failed to display the system. One more Open Source OS for today, Visopsys, the Visual Operating System was first released in 2001. Time for an update, with a handful of 1 or multi floppy Linux distros running from a ramdisk, some of them are installable. It's a rescue disk with support for a lot of hardware, in one word, it's useful! -Another set of rescue floppy disks, cramdisk-2.0 comes in 4 versions, 2 of them will boot with only 4MB on a 386SX and offer networking (using PPP or NE2000, 3C509) or support for the parallel port ZIP drive. -Small Linux can run on even lower specs, a 386 with only 2MB of RAM and 20Mb of HDD space if you install it, it also has an optional mono or VGA16 X Window server. -Monkey Linux is an installable only distribution, using UMSDOS, coming on 5 floppy disks. It needs a 386SX with 4MB RAM, 20MB of space on an IDE HDD (+ 10MB for SWAP) and atleast a VGA card for X Window, it comes with optional packages, extra X Window servers, Netscape, DosEmu and more. -muLinux is, in my opinion, pretty great, bordering on amazing even, it comes with a lot of extra add-ons, can run from RAM or be installed to a hdd in UMSDOS or ext2, can run with only 4MB of RAM on a 386, supports a lot of hardware, it's the first of the mini distributions I used extensively on a 486 laptop I had lying around! And to finish this long post, I can already imagine people complaining about Linux being a mess, Unix being way better, and all this and all that, so you'll be delighted with two versions of PicoBSD, a 1 floppy version of FreeBSD. There are duplicates and badly named (regarding the version number) floppy images, you're warned! Last edited by lolo799 on 2018-8-21 @ 09:46, edited 1 time in total. They are all unique in their own ways. This thread should be pinned. I love seeing these alternative OS for older systems. Now I'm going to have to see if I still have the QNX CD (can't remember which version) I had with the QNX Operating System System Architecture book (still on my bookshelf) that they sent me back in the day. Have you tried Plan 9 from Bell Labs? I tried Plan9 once, interesting academic exercise... not much you can do in it given there are different protocols due to its architecture (more cluster like). Shame it was a really good idea for an OS, and perhaps what Unix should have been. Still it introduced me the world of Ed Wood. I can't find any of the old versions of Peanut Linux. I remember running it via loopback off a FAT filesystem.